While it’s hard to believe that this is a typical experience, it only takes one extraordinary experience to make a huge difference. If that experience is good, wonderful things happen. If that experience is poor, there is always the chance that our always-connected world makes your business a celebrity – but not in the way you want to be known. Great companies realize that great experiences can create more business for them. They also know when it’s time to say goodbye to a customer who wants to leave. Providing a great customer experience is absolutely important to customer retention and loyalty. Smart business people also realize that providing a great customer experience for someone who doesn’t want to do business with you anymore can be just as important. That last impression can be vital. How you say goodbye is just as important as how you say hello. I’ve been using videos for our dealership since 2009 when I saw a seminar by Jim Ziegler at NADA. I was very impressed and went back to Chicago and bought a video camera. Since then, we’ve put up over 2,700 videos on YouTube. The best practice of 3 to 5 minutes for a video is well known and has a firm foundation. But it’s not gospel. Let me explain. In my mind, for dealers, there are basically four kinds of videos that you can make for your dealership and varying lengths that are acceptable for them. Branding videos – very short, maybe 1 minute max. Branding Videos are basically advertising your store or product and services. Customers have a very low tolerance and acceptance for them because they are “push” marketing similar to TV commercials. Need I say more? These should be very polished and you probably want a professional involved. Conversion videos are videos created and sent to customers by a salesperson on a specific vehicle because “a video is worth a thousand photos”. It allows the salesperson to introduce him or herself, plug the store, and ask for the appointment. The customer wants to see that car and is willing to watch a little longer. True Walkaround Videos are not directed at a particular customer. They are intended to be useful to those researching a particular model. Consumers who are researching want to see as much as possible about a particular vehicle so they can compare it to competing models. They will watch the entire video if it provides what they are looking for. Instructional Videos teach something and the complexity of doing so can cause varying lengths of time. Consumers understand that. Something simple can be taught very quickly but some things take longer just to get through the steps. The consumer will follow along based on their interest. There are exceptions to every rule. The real key is whether you are providing the entertainment factor or are providing the information that is being sought by the consumer. A customer that is looking for detail will not appreciate it if you skip over those details to keep your video short. Best practices are there to be a guideline, not a rule. Always practice being a consumer and that will tell you when to go beyond best pratices. Visit with me at AutoCon2012 in September! With the latest Telephone Communications Protection Act (TCPA) rules settling into place, we’ve got to remember that not all texts are created equal. Is your dealership’s texting up to snuff? Do what it takes to get there…because 97% of texts are opened and read within 3 minutes vs. 22% of emails! As of January 14, 2013 – Messages (phone calls and texts) must include the ability to immediately opt out. 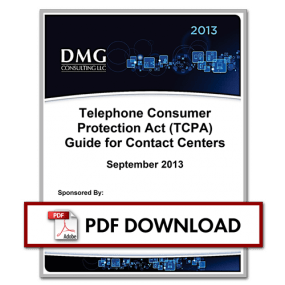 As of October 16, 2013 – You must get unambiguous written consent before sending telemarketing calls or text messages via automatic telephone dialing systems (ATDS). As of October 16, 2013 – Established business relationships with consumers no longer relieve you of that written consent requirement. First Things First: What Are the New Rules? So, what can your dealership do to insure compliance? Check out these seven pointers, then make sure you do your research and talk with an attorney for specific legal advice*. #1: Do you use SMS ShortCode programs for blasting text messages out to a long list of mobile phone numbers (used for mass marketing specials, contests, etc.)? While they can be effective, they’re probably the most heavily regulated type of texting. It’s also the type that got the Lithia group in big trouble a few years back, resulting in a multimillion-dollar settlement. You may want to hit pause until checking with your vendor and attorney. #2: Do you (or others at your dealership) text with customers? If your employees text on behalf of the dealership from their personal cell numbers, you have a problem. You likely have no idea how employees got customers’ numbers and no record of their written consent to be texted. You also probably have no transcripts of the conversations and no control over opt-out messages. So while your dealership needed a system to manage and control one-to-one text messaging before the new TCPA regulations—a system like Contact At Once! Mobile Text Connect (MTC)—the need is truly urgent now. #3: Do you have a process for gaining a customer’s express written consent to text? #4: Do you tell customers that “message & data rates may apply” when they text with you? #5: Do you offer clear ways to opt out? #6: Do you have a process for those who opt out? #7: Do you already use a vendor to help manage your dealership’s one-to-one text messaging? Think that texting just isn’t worth this extra effort? Think again. Texts sent to your customers bypass clutter and get read—Adtruth says that people check their smartphones 150 times a day. And it’s in our interest to keep it that way. So while any rules change can be annoying, these TCPA changes can help prevent spammers from diluting a powerful communication channel. That’s worth a few extra steps to ensure compliance! *Please note: This article does not provide legal advice. Please consult your attorney for legal advice that pertains to your situation. Beware of Lead SCORING Systems… Lead SEGMENTATION Would Help Dealers Sell More Cars! Mobile tips you shouldn’t overlook..
About a month ago I had the honor and privilege of speaking at the Automotive Leadership Roundtable in Miami Beach, Florida. As each of the previous ALR events have been, the venue was superb and the dealers who attended were among the nation’s most successful and each of them true leaders within our industry. One of my favorite General Managers, Mr.Richard Bustillo of Rick Case Honda was a featured speaker at this year’s Automotive Leadership Roundtable and tells me that one of the most productive uses of his time is the contacts and networking connections he makes at this premier industry event. Another more recently acquired friend of mine who is a dealer, Neil Amaral had accepted my nomination to attend the ALR event as one of the top independent car dealers in America. His “Amaral Auto Sales” dealership in New Jersey puts many franchised points to shame in all measurements of dealership operating criteria, including units sold, customer satisfaction and retention.. During and shortly after the ALR event, Neil opened my eyes up to an opportunity for car dealers that translates into sales and profits which I am sure too many dealers fail to take advantage of… The power or networking in the Auto Industry. Although I am going to use an example specific to Amaral Motors, it is merely one of many examples I have witnessed or participated in over the years… Profiting from a network of professional contacts. Previous to this year’s ALR event I had several conversations with Mike Timmons and Ken Potter at TrueCar regarding a Used Car Affinity Sales Program for TrueCar dealers.While at ALR I took the opportunity to Introduce Neil Amaral to both Mike and Ken from TrueCar. Before the end of the event, they had worked out a deal for Amaral Motors to be an exclusive TrueCar Used Vehicle Center for their area of New Jersey. As Neil pointed out when he thanked me, had he not listened to my description of the ALR event and trusted me as part of his professional network, he would not have secured his deal for the TrueCar Used Car Program at Amaral Motors. As difficult as it may seem at first glance to be able to predict such “six degrees of separation” type of connections, it is actually a lot simpler than most dealers realize. Let me explain, because of social and professional networks online, today’s automotive professional and his or her networks of business connections are more readily available and visible than ever before. Take a look at my profile onLinkedIn.com/in/RPaglia and you will see that there are over 200 auto industry professionals who have written recommendations of some sort… It does not take a clairvoyant to predict the potential for referrals and introductions. Neil Amaral is a lot like several very successful dealers and General Managers I have known over the years, he sees the opportunity to leverage relationships for the benefit of his dealership’s marketing, sales and operational efficiencies, then focuses on developing those relationships. In many cases, the dealers who are the most effective at getting more value than other dealers spending similar amounts of money on the same auto industry suppliers are the ones who focus on their relationships with key people working or running those supplier companies and business, while creating the desire within that supplier organization to deliver above and beyond what the dealership is actually paying for. This begs the question… Do the dealers who focus on developing relationships with key marketing resources, thought leaders and suppliers get more for their dollar than the dealers who maintain arm’s length relationships and focus on negotiating price points? Do dealers who belong to online networks and professional communities such as the Automotive Digital Marketing Professional Community establish relationship networks on a more efficient basis than those dealers who do not become active members of such networks? …Are you one of those dealers? Used Car Dealers: How Much are you Leaving on the Table? How to Find a Reliable Used Car Dealer in NJ. So what does this means to auto dealers? It means that they may need to put a little elbow grease into posting their inventory on Craigslist; this could mean adding a staff member or allocating this responsibility to an Internet or BDC manager. Our most valuable assets are our integrity and the integrity of our staff, vendors and advertising sources. I’ve decided to take an alternate path and train our dealership personnel to properly upload their vehicles to Craigslist and abide by their terms and conditions. We will always ask this question and decide: is it just, fair, and right to do what we intend to do and put ourselves in their (Craigslist) position. The answer is obvious. We will prosper and grow when we obey their ‘laws’ even if we don’t like them. Cadillac CTS-V at high apeed run across Nevada desert on way to Vegas. Should Managed Chat Be Part of a Lead Acquisition Budget? Lead Acquisition Budget: Are Managed Chat Service Providers A Lead Source? I was speaking with an Internet Sales Manager a few days ago and we were discussing the budget she managed for purchasing leads from the traditional 3rd party lead providers such as Dealix, Autobytel, Automotive.com, CarsDirect, etc. The question arose as to which lead providers should be considered reasonably eligible for allocation from a budget category earmarked for acquiring sales leads. It was interesting to me that she seemed to consider AutoTrader.com to be a lead provider, when in fact, AutoTrader has never sold leads, nor will they acknowledge being in the lead selling business… AutoTrader has staked their business model around being an advertising channel whose media is focused on showcasing a dealer’s inventory. So, why do some people incorrectly list AutoTrader as a lead source? The simple answer is that most of us will evaluate our results from AutoTrader based on the number of sales opportunities generated (Leads). Just because that is not what AutoTrader is selling, does not mean that leads are not what we endeavor to buy when we cut a big check each month to ATC. This raises a few questions about Lead Acquisition budgets for car dealerships… When is a supplier considered eligible to being allocated budget from an Internet Manager, or Marketing Director managed lead acquisition budget? Which types of suppliers should be considered? If there is one category of supplier that has created a whole new source of leads that did not exist ten years ago, it is the services offered by managed chat application providers. These “Chat” apps can be placed on a dealer’s website, as an email link, on a dealer’s various blog sites and microsites, even in some cases on a dealer’s Facebook Page as well as other social media channels. In almost every case, suppliers such as Contact At Once, ActiveEngage and CarChat24 will be evaluated based on the number of leads they generate for the dealership as a percentage of total chat sessions and unique visitors to the dealer’s websites, microsites, social media channels and emails opened. The big difference between advertising channels such as AutoTrader.com and Cars.com, and the major Managed Chat Service providers is that AutoTrader/Cars.com et al has never embraced the leads generated model as their value proposition, yet the Managed Chat Service providers have… So, why would we consider AutoTrader/Cars.com a lead source, and not put the Chat providers in that category of expense? While preparing this article I contacted Shereef Moawad [shereef@carchat24.com] at CarChat24 and asked him for some aggregated performance metrics around Managed Chat Service as a lead generation model. There are two reasons I reached out to CarChat24; the first is that they are the only Managed Chat Service provider that I know of which has worked for dealers on a performance based fee structure that used quantity of leads generated to determine the dealer’s cost for their software and services. The second reason is that CarChat24 has been a sponsor of the ADM Professional Community for longer than any other company, and I am very comfortable with their professional competence, business integrity and the objective validity of their data. Besides that, the company is run by a couple of US Marines (retired) with a remarkably clear focus on exactly what their mission is and the execution of tasks required to deliver measurable results. Of course, we also had to invest advertising in getting traffic to the sites where the managed chat services are provided, but from a pure cost per lead perspective, the use of Managed Chat Services as a lead source looks very viable and fiscally prudent. 7% of Leads generated were VIP Appointments. When analyzing lead generation, there are always questions about whether or not these leads are “incremental” and do they come at the expense of other forms these very same customers would have used to contact a dealership if the chat service was not provided. In almost every case, research and marketing studies have found that leads generated via Managed Chat Applications on websites are indeed incrementally additional leads. In other words, the leads provided by Managed Chat Services do not come at the expense of the original website’s form fill conversion… They are a net gain in overall volume of leads the site is generating… It is safe to say that Managed Chat increases every web site’s overall visitor-to-lead conversion rate. When the facts are considered and a performance based model is available, it is difficult NOT to justify allocating lead acquisition budget for Managed Chat Service Providers as a valid lead source. If you examine the logic in a little deeper detail, there is a strong case to be made that Managed Chat Services are NOT advertising and are in fact a lead generation source. You could even say that one of the outcomes from a dealership’s advertising should be increased chat sessions handled by your chat service provider, along with an uptick in leads generated. So, consider allocating a portion of your lead generation budget to a Managed Chat Service provider… It makes sense and will help you generate more dollars of profit for your dealership by providing additional lead volume from the most valuable type of leads you can get… Exclusive First Party Leads! Can a computer sell a car? While much of the online car selling process is automated these days, the answer is still no. To successfully sell a car online, there are a few essential points that auto dealers and individual sellers need to remember. Mere hours of work, invested by a few people, can dramatically improve your vehicle sales online. 1. Do you have great descriptions to hook your reader? When you’re selling online, you need to engage your reader the same way an author does, in the first paragraph. Do you have detailed, complete vehicle descriptions? If not, don’t expect to sell cars. Use safe terminology — avoid words like “mint” or “new.” A car isn’t new if it’s three years old. Rather, use ambiguous or interpretive terminology like “very clean,” which won’t cause problems down the road. Use words people relate to — “well maintained,” “local,” and “accident–free” are examples. Tailor descriptions — is it summer? Then describe the efficient A/C system. Winter? Mention the vehicle has a car starter and heated seats. Instil confidence in the reader — use words like unique, rare find, great find, very successful, award winning, economical, powerful, safe, beautiful, stunning, eye catching, head turning, best-selling, etc. Customers want to know they’re making a great buy. The industry is changing. Things like “Tilt” and “ABS” are no longer selling features. People now want to know the MPG or L/100km they will get on a tank of gas. Honesty is important too; if a vehicle has high kilometers, admit it — but focus on its spotless service record. Bottom line: writing good descriptions will increase the amount you get paid for your vehicles. 2. Have you posted pricing for all of your vehicles? While some dealers feel that more people will call if there is no price, this is never the case. You should at the very minimum post a MSRP for new vehicles and make it easy for a consumer to submit a lead for more information. Pricing should always be posted for used vehicles — no exception. 3. Are your descriptions legible? Ensure that your listings have proper spelling, grammar and easy-to-read fonts. Avoid wild colours, OVER-CAPITALIZATION (AKA “caps lock syndrome”), and fancy fonts as these elements will not give you more attention, but rather annoy the reader. 4. Are you consistent across all postings? Complete descriptions, detailed photos, proper prices — all of the elements that make a good vehicle posting need to be applied across the board on your listings to capitalize on return traffic. Consumers will research for 3-6 months before making a purchase, meaning they will return to your site multiple times; you should convey the correct brand message on each visit. 5. Do you have photos for all of your vehicles? Having good vehicle photos should be common sense; customers want to see a car before they buy it. Do you have pictures for all of your vehicles? Do you have them online as soon as a car hits the lot? You should, or you could be losing sales to the competition. Highlight selling features — focus on what matters to your buyer. Selling a minivan? Focus on interior and safety. Timeliness is extremely important — get pictures online within 48 hours of the unit arriving. Include a variety of photos — give your customers an online walk-around of the vehicle. Take Interior & Exterior Photos — get every angle: under the hood, the dashboard, seats (front and rear) and the exterior. Side-by-side, which looks more appealing: no-name pop, or Coke? Which would you pay more for? Having vehicle photos is like branding. It makes customers more confident in your product, and increases sales while allowing you to ask more for a vehicle. The principles are the same online as they have always been offline. If someone came in to buy a Cadillac Escalade, you wouldn’t bring up gas mileage. The point is to tailor your photos and descriptions to each vehicle. This is the best way to build quality leads that will make you a lot more money. via Online Car Selling Checklist – Automotive Digital Marketing Professional Community. You are currently browsing the archives for the Automotive Management category.